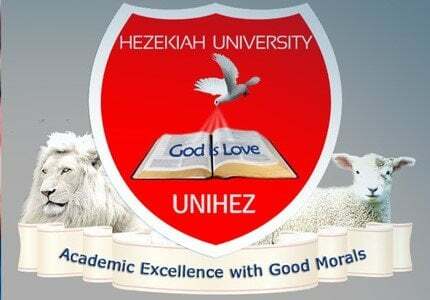 Hezekiah University, UNIHEZ academic and non-academic staff job vacancies application is out. Suitably qualified individuals are invited to apply for the underlisted post. UNIHEZ – Non-Academic Staff Positions. Registrar, Bursar, Deputy Registrar, Principal Assistant Registrars, Senior Assistant Registrars, Assistant Registrars, Accountant, Internal Auditor, Administrative Officers, Administrative Assistants, Higher Executive Officers, Executive Officers, Computer Operators, Caterers, Nurses and Laboratory Attendants, Purchasing Officer, Stores Officer, Clerical Officers, Accounts Clerks, Audit Clerks, Drivers, Porters, Cleaners, Gardeners, Messengers, Library Assistants, with knowledge of e-library and cataloguing tools. Requirements:- A Ph.D. with a minimum of five years experience or Master’s degree with a minimum of seven years experience or a good Bachelor’s degree with a minimum of ten years experience in University management and administration. A diploma in Administration or Law is an advantage. The candidate must be a person with high degree of integrity and moral discipline as well as endowed with strength of character and determination, imagination, creativity and innovation potentials. Requirements:- A good honours University degree in Accounting or Banking and Finance plus membership of relevant Professional Bodies with qualifications such as ACA, ACCA, IB, etc. This position requires also a minimum of ten years cognate experience. The Bursar must be computer literate with vast knowledge in operating various Accounting software. Higher qualifications are added advantages. The candidate must be a person with high degree of integrity and moral discipline as well as endowed with strength of character and determination, imagination, creativity and innovation potentials. Requirements:- Same as the requirements for the post of the University Bursar. Applications are also invited in respect of other non-academic staff vacancies from applicants with relevant qualifications. Applications with C.V which embodied relevant data about the applicants including GSM phone numbers and e-mail addresses shall be received up to 20th July, 2015. UNIHEZ – Academic Staff Positions. Accounting, Business Administration, Economics, Political Science. Pure and Applied Chemistry, Botany, Zoology/(AnimalScience), Mathematics, Computer Science, Physics. English Language, History and International Studies, Christian Religious Studies. A Ph.D. degree with evidence of academic leadership in terms of Research, Publication, and Development as well as administrative experience. In addition, the candidate must have at least twelve years of cognate experience in full time teaching in a recognized University. Note: Research-active Professors who meet prescribed internationally recognized contributions in academic leadership have added advantage. Requirements are same as Professors but with at least ten years of cognate experience. Same as Professors, but with at least Seven Years of cognate experience. A Ph.D. degree in relevant field with at least five years cognate experience. A Ph.D. degree in relevant field with at least four years cognate experience. The candidates should have at least a good Master’s degree in relevant disciplines. Applicants must have in their Master’s degree, a Cumulative Grade Point Average (CGPA) suitable for undertaking Ph.D. Programmes. Note: Part-time Lecturers are also required but only in the categories of Professors, Associate Professors and Senior Lecturers. Requirements: – A good University degree plus an advanced degree in Librarianship. Candidates must be highly resourceful in the use of Information and Communication Technology (ICT), computer-based cataloguing and e-Library literacy. Also a minimum of ten years post qualification experience in library management is required and/or an advantage. The candidate must be a person with high degree of integrity and moral discipline as well as endowed with strength of character and determination, imagination, creativity and innovation potentials. Requirements: – A Ph.D. degree from a recognized University with scholarly accomplishments and with a rank of a Professor. At least a minimum of fifteen years of post-doctoral academic experience, with good track record of research and development (R&D) and publications. The candidate must have had administrative in-depth experience in the University system such as Head of Department, Dean of Faculty and/or Deputy Vice-Chancellor. UNIHEZ – Academic/Non-Academic Staff Positions [Method of Applications]. List of publications (where applicable), publishers and dates. Names and Addresses of 3 referees who should send confidential report under separate and sealed cover, addressed to the Registrar. Date to start work should the candidate be given the job applied for. Applications may be sent by Courier Services, through post office addressed to The Registrar, Hezekiah University, Umudi, P.M.B. 3002, Nkwerre, Imo State or in person to the University campus or through other delivery means, to reach the under-signed on or before the closing date. Online/Softcopy of the Application: Applicants should as well submit a softcopy of their application and C.V. to: jobs@unihez.com or register online at www.unihez.com/jobs. Remuneration and other conditions of service for the right candidates are very attractive, but competitive.